The XO laptop for One laptop Per Child. You want one for your kid. You want your kids to "learn learning", too. You want one for your nephews and your neighbors' kids, so that you can use that great built-in mesh networking together. You want one for your neighbor. You know he'd appreciate the little web-browsing, sunlight-viewable screen marvel. You want one for the kids in the poor elementary school across town that usually have to make due with old books and overworked, underpaid teachers. Heck, you want one for yourself, because you love the entire concept, the grand possibilities, and the magnificent vision behind this practical work of art. But you shouldn't want something meant for the poor, underprivileged kids in developing countries. Obviously, it is only gadget-lust. Or is it? Is it a bad thing to want this edutechnological revolution to come to your town and make a difference in your life and in the lives of those around you? Should we simply be content to wait? I am Gabriel Morales. I say no. And I say it with conviction. If it meant depriving those children in developing countries of the little machine that is after all, designed and meant for them, then I could not justify it in good conscious. But I don't believe that this is the case at all. In fact, I believe the opposite is true. I believe more of those children would get access to an XO laptop more quickly if OLPC were to open up Give 1 Get 1 sales to developed countries as well, and I firmly believe that there is a market for the XO in the developed world, and that it would greatly benefit children and adults alike there. Such a proposition, if properly executed, could be a win-win situation for both the developing and developed world. Bringing the XO to the developed world, en masse, means bringing down production costs increasing the project's mindshare, very possibly leading to increased sales of the educational device to its intended target. It is also a means by which the developed world can subsidize the XO laptop to the developing world. Not only that, but the combined benefit of the proliferation of the XO platform would increase its value tremendously. Children in developing countries would be playing, working and learning on the same specially-designed, open source platform children in developed countries would. This in turn, also increases support of the platform. With more people using XO laptops and more developers with access to them, it is a practical assurance that more educational and practical software would follow. The Give 1, Get 1 offer, which started on Monday, is a good start, but it is not enough. It is too limited in its scope, and while those of us who believe in the project are happy to put down $400 for one, this roughly 100% markup makes it too costly for large orders, and leaves too many of the people who would benefit from an XO laptop in the developed world out. Another issue with the Give One, Get One offer is the limited areas in which it will operate. Wayan has suggested using a mail forwarding service, and has even enlisted the help of a particular UPS store, which we all hope will bring the joy of the XO to other parts of the world besides Unites States and Canada. This is only a temporary work-around to an issue that should be addressed by OLPC and its chosen distributors instead. Something much more expansive and inclusive is called for. Already OLPC has taken some positive steps forward, by opening up donation offers to individuals and organizations outside of governments. And I really believe OLPC would benefit greatly from taking yet another step forward and simply opening up sales. What I am proposing is that OLPC open up XO sales to all public and private schools, educators, parents, and in fact, the general public to the developed world at large, at an affordable price, perhaps something like a 25-50% markup initially. Not to say that opening up sales is a trivial matter. There are lots of details to take care of and distribution in itself is a job. We've already seen various telephone ordering hiccups caused by an inexperienced and perhaps initially ill-prepared staff with the Give One, Get One offer. Production needs to ramp up to meet the demands of such an expansive distribution program. We certainly don't want a situation where developing countries are denied XO laptops because demand must be met in developed countries. However, the bigger a market is the more that can be produced at lower cost and the more willing a manufacturing plant is to increase production due to lower risk. In the end, if there is indeed enough demand (and I believe there is), it should work out to the benefit of developing countries. There are definitely some risks, but I think the benefits are overwhelming. To that effect, I have set up a new website called XO For All to represent the interest of those of us supporting open sales of the XO laptop. Everyone's welcomed of course. As more and more users get an XO laptop and the community grows, OLPC needs to know that there is a growing group out there that wants access to this innovative new platform and that everyone will be better for it. I think theproblem is really because the foundation is so overwhelmed and understaffed that they simply cannot afford to focus energy on leading with marketing, distribution, stocking, sales reps, consumer complaints and the like. The only way I see this happening is if someone steps in as the middle man, buys 10.000 laptops from olpc for 200 dollars and retails them for whatever price they can get (around the 300 price point of the eee pc). We can wait until wal-mart does this for us. Or you, Gabriel, can use xoforall.com to do precisely that. Count me in if you need help. 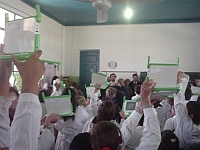 Want to get more people using the 'OLPC'? You have to ask whether the delivery of the hardware actually matters, in the developement cycle there were releases of a LiveCD and vmware images. These have 'dried up', the ones available are old and out of date. If some software effort was put into making a bootable LiveCD or an emulator package, you could get 'western' kids playing with the software now, without impacting the supply chains of the real hardware. The meshing could be simulated with some form of P2P networking overlay (such as Hamachi). Like you say 'the more players, the better the game'. Actually, I was thinking that if they didn't open it up to developing countries, there would be an artificial shortage among people who would be willing to pay a lot. And that would increase the chances that somebody corrupt might start hijacking the donated laptops and selling them on the black market or eBay. @Simon: While the updates for the Live CD were stopped due to a lack of manpower there are still VMWare-ready images that you can find at http://dev.laptop.org/pub/virtualbox/ (build 625 is latest preconverted image). I tried that version on the weekend and it worked really well! By the way, I don't think that the demand for the software (be it in emulator or Live-CD form) is that big at the moment because otherwise someone would have taken the time to convert the build images into those formats. It really wouldn't take more than one or two dedicated developers to that on a monthly basis or so. Thank you for your effort, Gabriel! I can imagine that OLPC even do not disagree with your opinion. I think they make one step after another in the right direction and have to be very carefull from making no mistakes. I would be highly interested to an official statement from OLPC to your initative. While I understand your sentiment, you mention its flaws yourself. You agree that any event selling XOs to consumers and first world schools should come after all orders from/for third world countries are fulfilled. It will be several months before all current orders will be completed, during which time hopefully other large orders are placed. Any program selling to the public should only exist if/when manufacturing levels exceed the number of XOs ordered for their intended purpose, which may not ever happen if the planned million unit orders start coming in. That said, I have no doubt that Quanta, if not OLPC, will eventually release a consumer model based on XO technology. @pixelfish - WOW! I'm stuned, it actually works and is networked (presumably only to other vmware users). You can share documents and work collaboratively. I can't afford a real OLPC, but I'm going to find a way to get this 'installed' on an old laptop and give it to my daughter to play with. I completely agree with Gabriel. Developed world children should be treated equally to those of the developing and be provided access to the XO with similar conditions. A 25% premium would be acceptable as support for the poor when selling XOs to the developed world. Any more jeopardizes the success of high volume sales which could further decrease the production cost of the XO. I completely agree. My 11 year old daughter has been wanting a laptop for a year now. After researching on the internet, looking for pc's designed for children, I could find only one. The XO laptop fufills a real need, which nobody else is adressing. The name of the organization is One Laptop Per Child, and if they are really serious about that, they should recognize that there is just as pressing a need for a good children's educational laptop in the developed world as there is in the undeveloped. I have gone ahead and purchased an XO just on the promise it represents. However I must say that I think olpc really needs to expand their operation to include marketing and support departments. Nobody at their 800 number ordering line seems to have a clue about the xo or olpc. Once you order, the only confirmation you receive is from paypal. An email from olpc with a thank you, confirmation number, expected ship date, etc would be a nice touch. Also where is the online support? Once I receive it, where is their forums to get answers? Where is there a list of 3rd party apps that will run on it? How do I update the software? (somehow I doubt it will be as simple as selecting 'software Update' and clicking Enter) How do I set up filtering? I'm sure some of these answers are buried in their convoluted wiki pages, but there needs to be a section for users (and children) in addition to developers. The need for marketing is really illustrated by the fact that every single person I've mentioned olpc to has never heard of them. Unfortunately by the time most people will have heard of this amazing laptop, the offer will be over. XO laptops selling for 2000.00 on ebay is not going to benefit anyone. 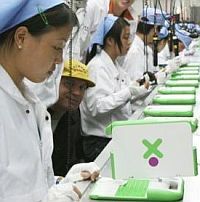 As commercial sales of One Laptop Per Child's XO laptop close on Monday, a user tracking the nonprofit effort said continued commercial availability of the laptop could benefit OLPC's nonprofit effort, the XO manufacturer and children using it as a learning tool. Gabriel Morales, a technology enthusiast in Miami, feels so passionately about distributing the laptop commercially that he has set up a Web site, XOforall.com, to drum up public support for continued commercialization. Thank you for the opportunity to publish this on your site, Wayan! I hope OLPC takes a good look at the worldwide demand for its revolutionary little laptop and makes some good decisions about distribution. i just would have a question to Andras Soltesz and Simon, since they "somehow" seem to be in Hungary/Hungarian. If you are working or struggeling with olpc anyway, I would be very happy if we could get in touch! I'm working for olpc in Ethiopia (magyar koordinatorkent legalabb ez ev szeptembereig) and would be very much interested in setting up something like "olpc Hungary" (as happened in many other european countries) - this would allow us to take more coordinated action/learn from each other, etc.! I am indonesian child i want xo laptop for me how i can get free i am not a rich family please come to indonesia.